From now through September 30th, Bushwick residents can submit proposals for public projects—and If selected at neighborhood assemblies, the projects will be funded with city tax dollars! Can you think of any public places or institutions in Bushwick that could use some funding beyond the constraints of a regular budget? The city's sixth cycle of its innovative participatory budgeting program is under way, and your elected officials want to know where you think your tax dollars should be spent locally. From now until Friday, September 30th, residents of New York City's 34th city council district, which includes Bushwick, East Williamsburg, North Side Williamsburg, South Side Williamsburg, along with the residents of 30 of the city's other 50 city council districts, are invited to submit their ideas for places that deserve some additional resources for continuing to serve the public. Each participating city council district has allotted at least $1,000,000 of funding towards the initiative, and 34th district city council member Antonio Reynoso has been an enthusiastic proponent of the model. Anyone can submit an idea into any of the dozen categories: culture and community facilities, schools and education, environment, housing, parks and recreation, public health, public safety, sanitation, seniors, streets and sidewalks, transit and transportation, or youth. Ideas are submitted directly onto an interactive map that displays other submitted proposals and lists project guidelines by category so users can tailor their proposals to the city's review process. Feedback from the city's designated volunteer budget delegates appears as it is added. Funding for our district's previous participatory budgeting cycle largely went to local schools. P.S. 120, P.S. 132, P.S. 239 and P.S. 18 received funding to upgrade to new technology, P.S. 257 got air conditioning in its gym. Other funding went to an upgrade to the playground at the Williamsburg Houses and to the addition of Real Time Passenger Boards to the neighborhood's transit infrastructure. 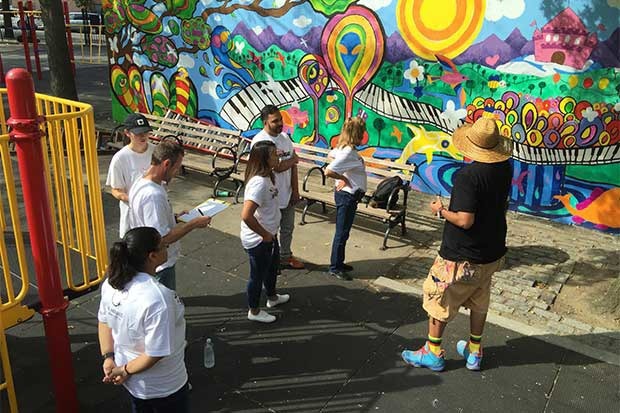 Featured image: Bushwick residents collaborate on a mural outside of P.S. 120 Carlos Fuentes, one of the sites that won participatory budgeting funding last year. Photo courtesy of Cityarts.